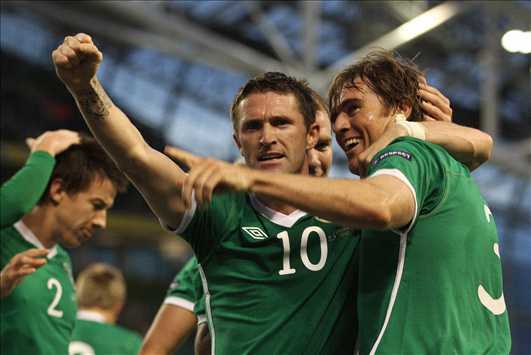 Republic of Ireland have battled to a scoreless draw in Sweden, the result which could prove crucial for their 2014 World Cup qualifying campaign, should they retain their impressive form and hummer resilient Austria. Austria put six goals past Faroe Islands in Vienna last Friday to record their biggest win in 14 years and rise to a third spot in Group C. They are one point behind second-placed Sweden and level on points with fourth-placed Republic of Ireland outstripping them on goals difference. Ireland have a good chance of leapfrogging second-placed Sweden, should they retain their impressive form and outplay potentially overconfident Austria. Philipp Hosiner is likely to retain his first-team place, after scoring two goals against Faroe Islands. Austria captain Marc Janko remains a major doubt for the game against Ireland, after missing out on the previous clash due to abductor injury. 21-year-old forward Andreas Weimann, who has managed to impress off the bench on Friday, could be given a chance of a first-team start. Both Martin Harnik and Julian Baumgartlinger could also feature in the first XI, after recovering from health problems. Captain Robbie Keane is expected to be Ireland’s most notable absence, as he limped off during the clash against Sweden with a calf injury. Wolves hitman Kevin Doyle has been called up by Trap to replace the experienced striker.